This is a sponsored post. This post is brought to you by Marzetti® Simply Dressed® and BlogHer. 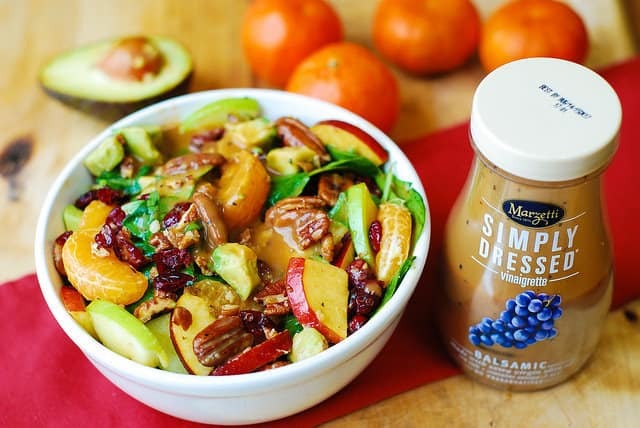 But what really boosts the flavor of this salad and combines all the fresh fruit and the fresh produce together so well is the amazing dressing: Marzetti Simply Dressed Balsamic Vinaigrette. The dressing is so good that my husband, who never eats salads for lunch, ate a whole bowl of it at noon and asked for seconds! Eating a huge amount of salad for lunch is so out-of-the character for my husband that I was shocked. It is really one of the best tasting store-bought balsamic vinaigrettes that I ever tried! What I also love about this dressing is that it uses a minimal number of simple ingredients, such as extra virgin olive oil, balsamic vinegar, sea salt, etc. It has no MSG, no high fructose corn syrup, no artificial flavors or colors added. 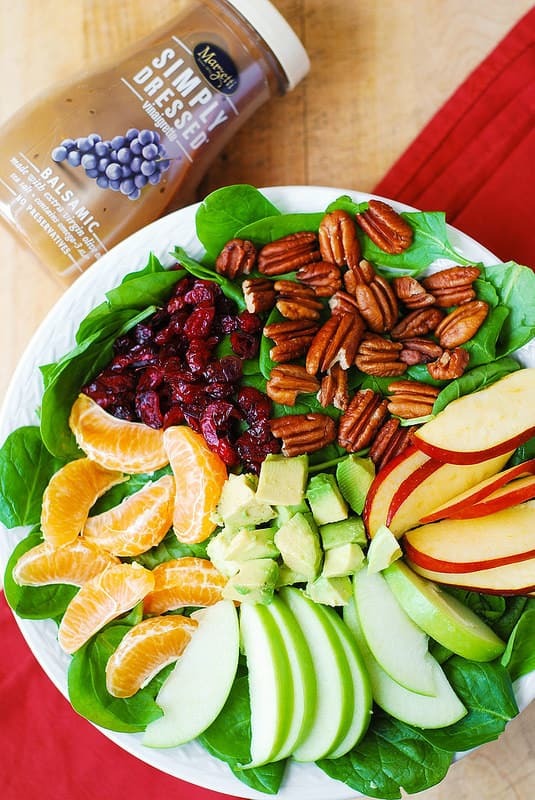 I see this dressing as a great way to incorporate more fresh green leafy vegetables, fresh fruit, and other produce into my family’s diet. Perfect for a fresh lifestyle! Because Marzetti Simply Dressed dressings have no preservatives, they have to be refrigerated, so make sure to look for them in the refrigerated section of grocers’ produce departments. 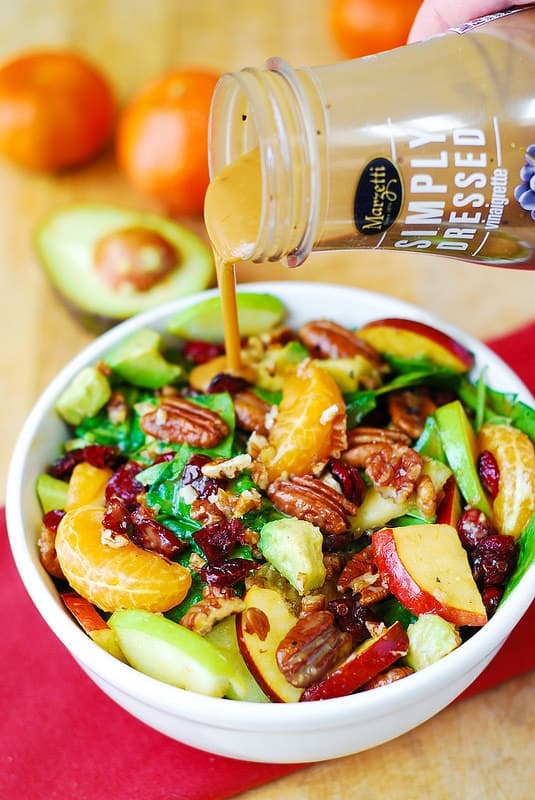 You will definitely find me looking and searching for more flavors of this brand: I really want to try their Champagne Salad Dressing, Pomegranate Salad Dressing, or Strawberry Poppyseed Salad Dressing, to name just a few! 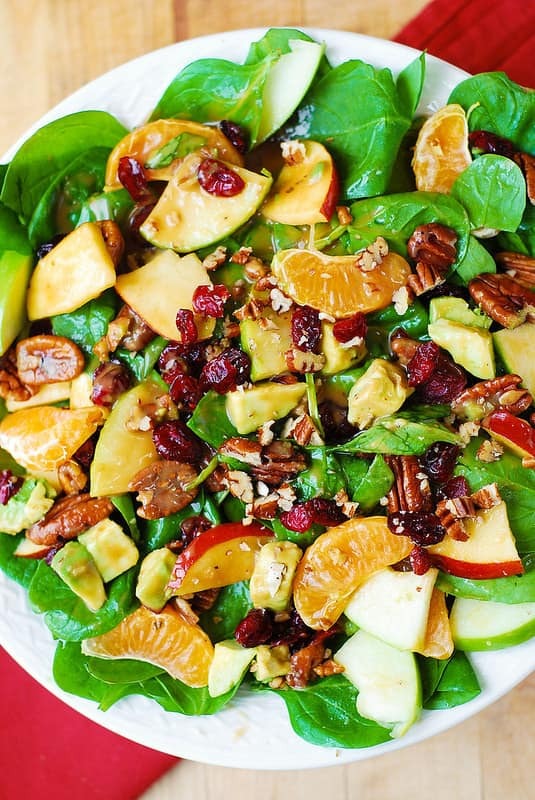 Make sure not to add the dressing to the salad until serving time, otherwise the spinach will wilt quickly. 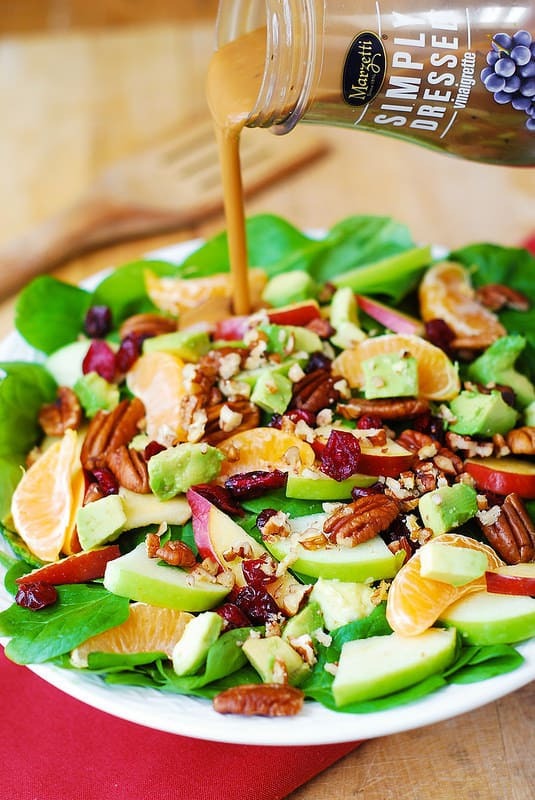 Add the dressing right before you’re ready to serve! 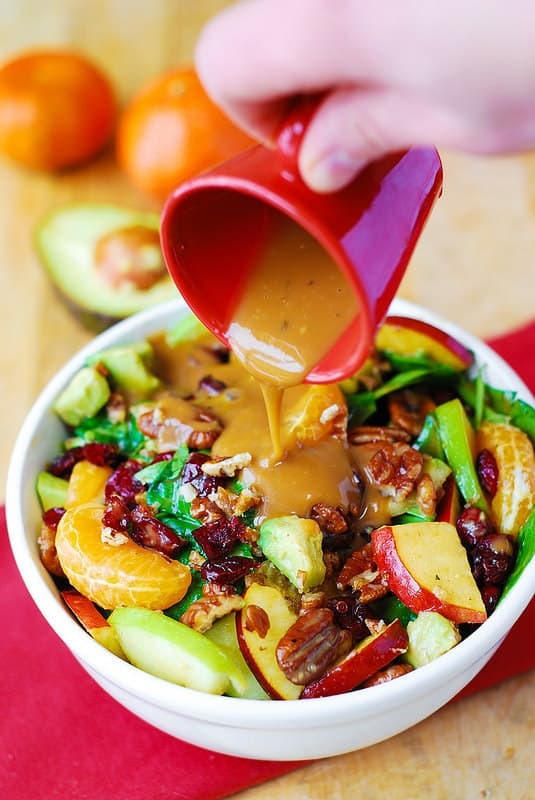 Also, drizzle just enough dressing to coat the leaves–don’t pour all of it at once–let your taste buds be your guide and use just enough to coat the salad lightly! Enjoy! Chop 1/4 cup of pecan halves into smaller bites - set aside. 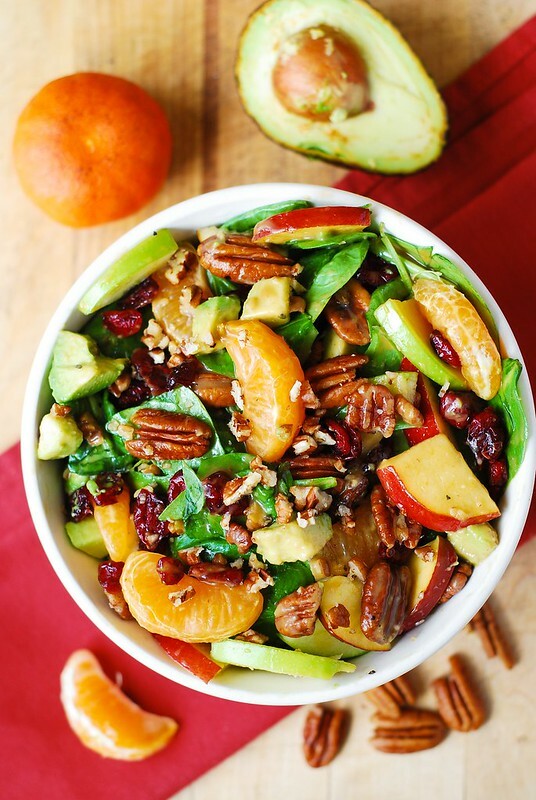 In a large bowl, combine all salad ingredients except for 1/4 cup of chopped pecan halves. Drizzle the salad with the dressing and toss. 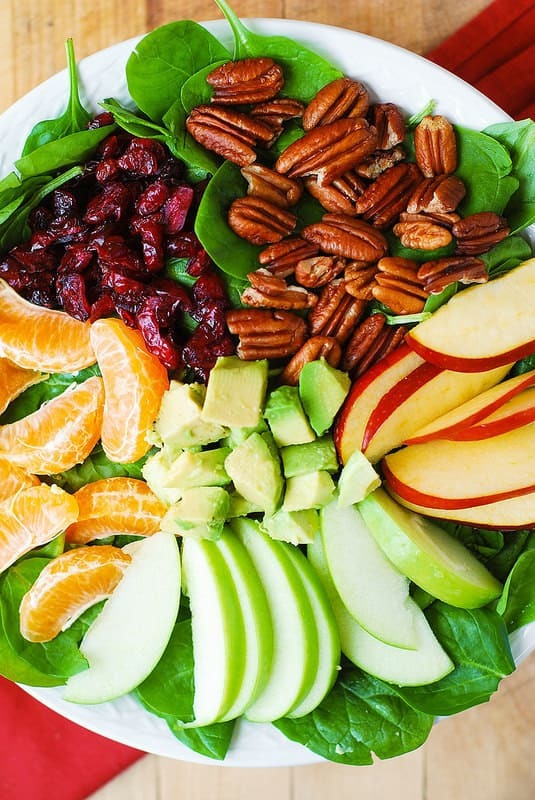 Sprinkle chopped pecans on top of the salad. Serve immediately. Note: This post is sponsored by Marzetti and the product has been provided by them. The opinions and ideas expressed are my own. How will you use Marzetti Simply Dressed refrigerated salad dressings to make fresh and simple meals for you and your family? Leave a comment below to enter for a chance to win a $100 Visa gift card. This sweepstakes runs from 4/1/2015 – 5/31/2015. 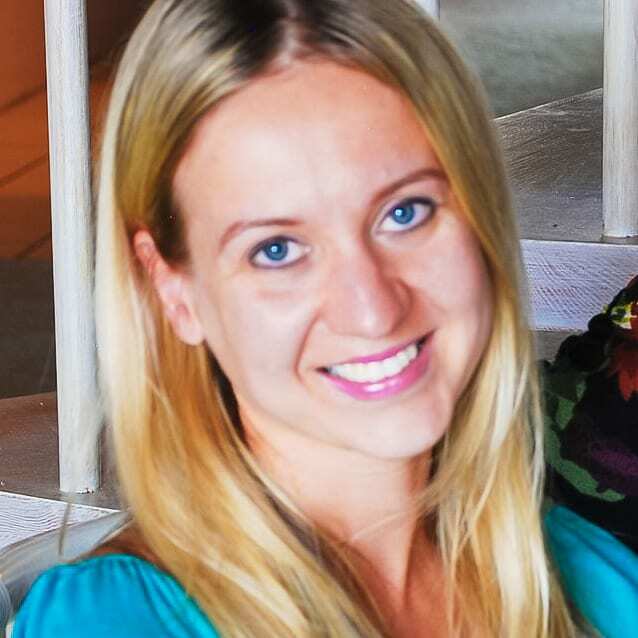 Be sure to visit the Marzetti® Simply Dressed® brand page on BlogHer.com where you can read other bloggers’ posts! I made this salad for a Birthday party and everyone loved it , the dressing was amazing with it! Thank so much making it again!!!! So glad you enjoyed this recipe! Thank you for such a wonderful comment! with the flavor of the veggies combination!